New Delhi: How much water does it take to cook a cup of rice? Recipe books would say two cups. Now consider this: It takes 2,173 litres of water to produce a kg of husked rice. That is a global average. Out of this, 1,488 litres is typically rainwater, 443 litres is surface or groundwater and 242 litres of water are required to carry off the pollutants produced during the process. For India, the figure is 2,688 litres. The number is worse for several states, including some of the largest rice producers, as the first story in this series pointed out. In the case of goat meat, the requirement can go up to 8,763 litres per kg. Looking at it in terms of nutrition, more than 10 litres of water are required to produce a kilocalorie of nutrition from red meat, while only half a litre is required to produce the same amount from cereals. These numbers become all the more important when you consider exports. In 2014-15, India exported 37.2 lakh tonnes of basmati. To export this rice, the country used around 10 trillion litres of water. To put it another way, India virtually exported 10 trillion litres of water. At least one-fifth of this would have been surface/groundwater. In these times of global climate change, water is the one commodity where you don’t want a trade surplus (i.e, exports higher than imports). 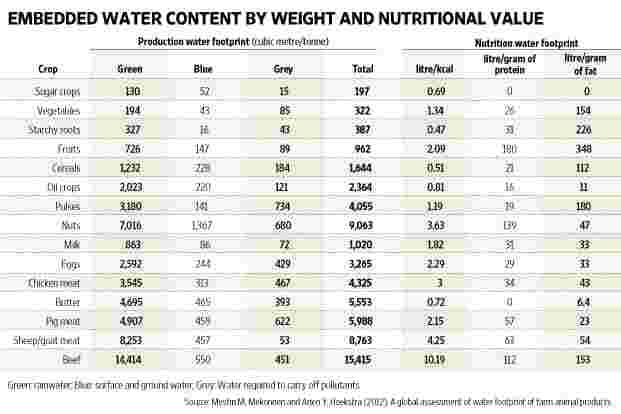 According to the Water Footprint Network (WFN) database, India had the lowest virtual imports of water in the world. How does it compare with China, which is the only other nation with a comparable population size? China is the eleventh largest country in the world in terms of virtual water imports and it runs a virtual water trade surplus in crop and animal products, that is, it has higher virtual water imports. 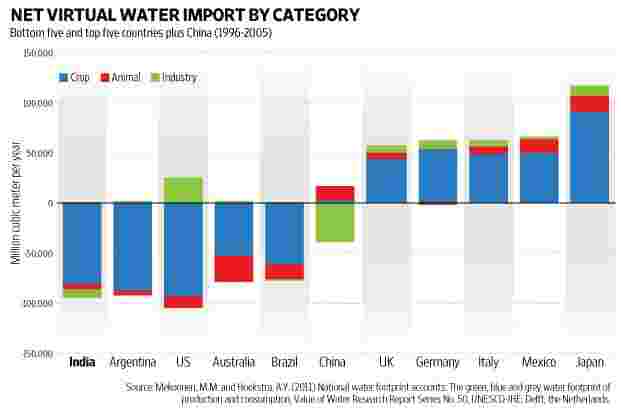 But China ends up exporting more water than importing because of its overseas sales of industrial products. In contrast, India is a large virtual net export of water because of agricultural products. One policy implication: While the country strives to increase manufacturing exports, care should be taken to maximize water use efficiency lest it ends up virtually exporting more water. Rudimentary trade theory suggests that a country should be exporting things which it has in abundance and importing those which are scarce. By that logic, India should be a virtual importer of water, especially so, when its report card of water scarcity looks very grim. The WFN database gives data on water scarcity for more than 400 river basins in the world. Water scarcity is defined as the ratio of total surface/groundwater footprint to surface/groundwater availability in a given river basin. If the ratio is 1, it means that available surface/groundwater is being fully utilized. But ideally speaking, averting water scarcity requires that not more than 20% of the water that flows on the ground is used by human beings. So, even a ratio of 1 denotes moderate scarcity. The WFN database recognizes four kinds of water scarcity situations: low (ratio<1), moderate (ratio between 1 and 1.5), significant (ratio between 1.5 and 2) and severe (ratio>2). Water scarcity is measured for each month. This is because water flow situation can be extremely skewed over a year. There could be excess flow on account of rains for a couple of months, whereas the rest of the period can witness abysmally low levels. Due to this reason, the WFN database classifies river basins by scarcity levels for different months in a year. Data for India shows that except for Brahmaputra and Mahanadi, all river basins with a population of more than 20 million experience water scarcity for a major part of the year. 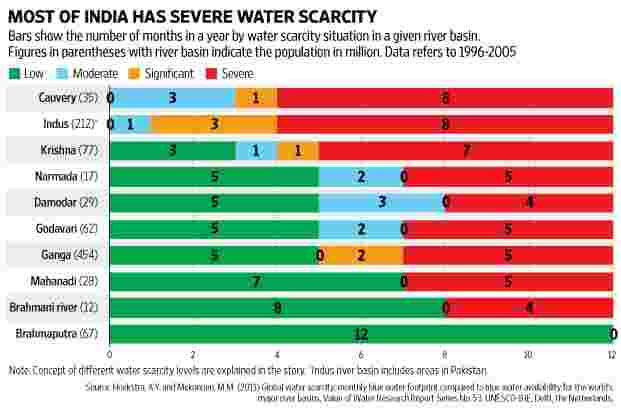 The two most populous basins—Ganga and Indus—suffer significant-to-severe levels of water scarcity for 7 and 11 months in a year, respectively. A caveat: a large part of the Indus river basin population would be located in the Punjab and Sindh regions of Pakistan. The upshot is that India is exporting large amounts of virtual water despite being an extremely water-scarce country. Should it be doing this is the question. This is the second of a two-part data journalism series looking at issues of embedded water. The first part looked at how inefficient Indian farms are when it comes to water use.